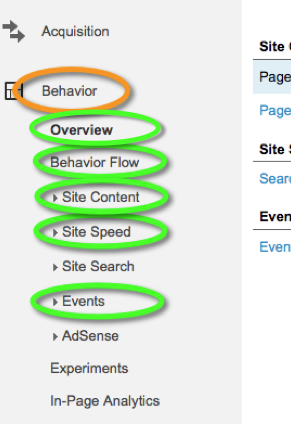 The Behavior reports focus how your visitors use and navigate your website. The primary metrics include pageviews, exit and bounce rates. If you’re not sure what these terms mean, revisit General Concepts. Overview shows a graph of traffic to your site and a list of the top pages visited during the selected date range. Behavior Flow is very similar to Visitor Flow in the Audience reports. Site Content reports analyze your visitors based on pages they viewed. You can segment this further by viewing the most used Landing Pages and Exit Pages or entering in a search term that can be found one of your pages URL’s. Content Drilldown groups your pages into files and you can view one group of pages at a time. Site Speed shows you how fast your site is loading. If it takes more than a couple of seconds the visitors will abandon the site, which can result in a bounce. Events are tracked by adding html code which records user interaction with website elements, such as outbound links or file downloads. If you would like to implement event tracking, please contact webhelp@wwu.edu and put Analytics Help in the subject line.